Combining a vacation with health improvement is far from new. For over two thousand years in Europe, generation after generation followed this practice. The spa resort environment is designed to relax, refresh and renew body and spirit. The accelerated tempo of our life, the permanent stress of the 20th century led to the spread of vasculous and nervous disorders. Lack of physical exercise, enviromental hazards, unhealthy diets and an extended life span have resulted in an increase in the number of those suffering from locomotor disorders. Growing levels of environmental pollution, together with the rapid spread of chemicals have increasingly turned the attention of civilized people towards nature. As a logical consequence, natural therapies are being rediscovered and are gaining popularity everywhere. The team of medical professionals working at the European spas and treatment centres do their utmost to combine human knowledge and experience with the achievements of natural sciences and technology. Bathing cures have an enormous advantage over drugs and surgery. They have no side effects provided the medical instructions are followed. 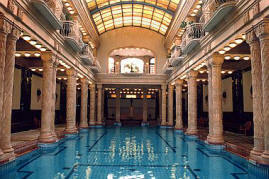 With its thousands of thermal springs, Europe is the world leader in medicinal waters. The composition of medicinal waters in Europe is very varied which means that there is a wider variety of therapies available for more disorders than is generally known.